For Audi: A6L Q5 Q7 A8 S5 A5 A4L A3 model in the third quarter (the original car with AMI interface). For Touran, Tiguan, GTI, Golf 6, CC, Magotan (formerly auto MDI-BOX interface). Notes:This cable is fit for Audi vehicles equipped with AMI. Physically, AMI is located next to the CD Changer, or located underneath the center armrest. 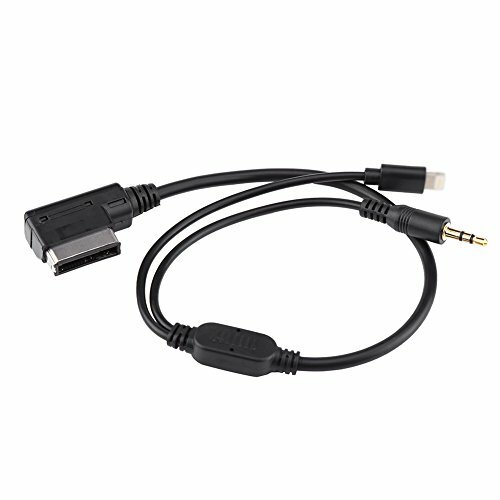 【COMPATIBILITY】: This audio input cable Wire is suitable for Audi A6L Q5 Q7 A8 S5 A5 A4L A3, ect. Allows you to listen your mp3 Player / iPod iPhone 5 5S 6 or other device such as HTC, Samsung, Nokia, Sony Ericcso. 【PLUG & PLAY】: 3.5mm aux adapter cable allows you to listen music and charging iPhone 5 5s 5c 6 & 6 plus at the same time. When connection is done, simply press MEDIA on the MMI controller buttons. 【QUALITY】: Auxiliary audio cable supports good sound echo, with latest and improved designs for Audi allows you to listen to the information for iPhone 5 5s 5c 6 & 6 plus output plug through your AMI systems. 【DURABLE】: Music interface adapter cable achieves high reliability requirements through copper core guarantees its antioxidation and keep high sensitivity even through plug countless time. 【Only Interfaces Audio】: AMI MMI AUX change adapter cable only interfaces the audio all other controls must be made on the phone itself. (i.e change song on the phone itself). If you have any questions about this product by Qiilu, contact us by completing and submitting the form below. If you are looking for a specif part number, please include it with your message.